The apartments at Saratoga and Abbott, before they were sold. 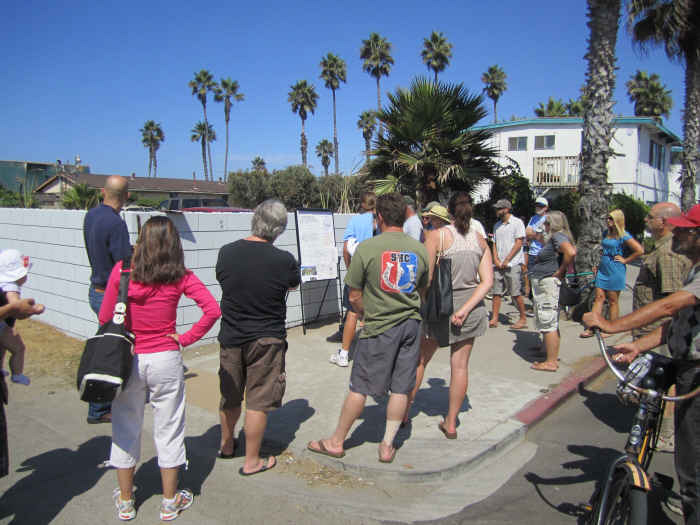 The OB Rag has just heard from residents of the apartments at Abbott and Saratoga – they have until January 2, 2013 to move out, as the 10 condo units of Ocean Park Villas will be constructed soon after. The 10 units will be condos in a 3 story building, 29 feet high, once the existing four buildings are demolished. Three of the buildings are apartments with a total of 15 units, while the fourth is a shack-like structure boarded up for years whose most recent tenant was Dempsey’s At Ocean Beach, plus it was also the original location of Hodad’s restaurant. Design of new 10-condo project. This has been a sordid affair for some, as the battle to save OB’s beachfront from being over-developed has see-sawed back and forth over the last couple of years on this project. It was just about a year ago, that the OB Planning Board voted to approve the new plans to a project that had had multiple problems. Back on November 2, 2011, then board members made remarks about the planned construction. Seth Connolly, now off the board, said the design smacked of a “fortress”. Finally, however, the OB planners determined that they had no basis to vote against the project, finding the applicant had made some changes in response to the board’s feedback. The vote was 9-2 in favor of the project known as Ocean Park Villas. Taylor and Tom Gawronski were the dissenting votes. OB Planning Board members give a “tour” of the project site, Nov. 2011. August 65, 2008: OB Planning Board by a vote of 4 to 3 agreed to allow the city to vacate the alleys behind the land at end of Saratoga and Abbott so that the developer of the project could put 2 additional units into his project. In return, the Parks and Rec department will be compensated for the 2700 square feet of land in question. 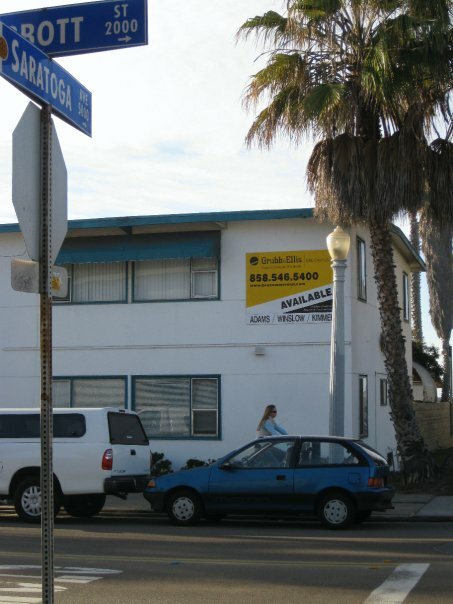 November 2009: the Coastal Commission approves the original plans for demolishing the current 15 units of the four detached buildings, including the former location of Hodad’s, and the construction of a two- story, 30 foot high 12-unit condo building, that would sit over a 27-space subterranean parking garage. The two alleys that border the west and south sides of the property will be eliminated, and half of the alleys will become the property of the new development. The entire alley area will be turfed for pedestrian use and open space. In July 2010, the property sold for $3.8 million, cash, to buyer entitled 1984 Abbott LLC, c/o Clark Realty Capital LLC, 3655 Nobel Drive, Suite 500, San Diego. Clark Realty is an Arlington, Va., headquartered real estate company. The new owners plans on developing 12 new townhomes with an average projected unit floor plan of 1,200 square feet. Summer 2010: Local OB architect Steven Lombardi presented his drawings to the OB Planning Board. There are a number of outstanding issues about this site, including the underground garage being built in a flood zone, the city giving up property adjacent to park land allowing the developers to intensify the project. Importantly, the OB Planning Board requested the new owners to consult with local architects, and bring a preliminary design to the planning board before they finalized their plans. The public right of way “give-away” concerns revolve around the fact the property line actually runs right down the middle of that right-of-way, and if vacated, half reverts to City property (park space) and half reverts to the owner’s use. But some believe that the City did not own all of that land, but had a right to use it that was based upon an obsolete public purpose. Sometime between the Summer of 2010 and the Fall of 2011, the proposed project switched hands. It was taken over by Marengo Morton Architects, Inc., with Claude Anthony Marengo leading the re-newed efforts to throw the project up. Because of changes, Marengo applies to the Coastal Commission for their approval of his amendment, bypassing the OB Planning Board. September 7, 2011: the project’s original architect, Steve Lombardi, returns to the Planning Board to inform them that the entity who had purchased the plans and permits for the Ocean Park Villas project has proceeded to make significant changes to the design (his design) and is attempting to proceed with the amendments to the Permit with the Coastal Commission under the concept of “substantial conformance”. November 2, 2011: The OB Planning Board votes 9 to 2 to approve the new plans. WiLL bE LosT iN the rubbLe….. I am sure the rent or purchase price of said condo’s will be totally affordable. I am guessing mostly Hodad’s employees and other locals will be living there? BWHAHAHAHAH lots of glass and steel coming to OB and I think we all know the people who will be buying those units won’t quite be “local”. Lots of locals shell out lots of cash to buy places in OB. Just because they’re ocean front at that location doesn’t mean “locals” won’t buy them. Maybe they will, maybe they won’t. I can’t imagine you’ll get the country club set buying them, what with the rough edge to our town and all. Do the bluebloods who live up on the cliffs or those who shell out an excess of $1M count as locals? We’re all from somewhere afterall. I live in that building currently and can confirm we just got the notice of eviction to be out by January 2, 2013. The notice mentions they only needed to give us a 30 day notice, but they were being nice by letting us stay for the holidays – hip hip hooray. I am moving out of SD in Feb, but what deeply saddens me is when I return to live or visit, I’m afraid OB will be very far down the path of gentrification. Ten new ocean front condos will be moving on in, with rent increasing from my current $895 (studio) to what I predict to be $2000+/month. Also, what is completely absurd is the fact that it is getting harder and harder to find a landlord that will rent to tenants that own a dog over 25lb. Come on, we are a 3 minute walk from the best dog beach in the world. I believe this apartment building was the LAST Sunset Pacific managed building that allowed dogs. Someone actually told me “You want a dog, buy a house”…Horseshit! Walking from dog beach this morning, my girlfriend and I noticed the new house on West Point Loma going up next to the only 3 story house on the strip. At least the Carl Demaio for Mayor poster was removed. btw, is that Justin Bebier in the blue car??? Will there be pedestrian access to the beach from Saratoga (either Saratoga Av or the allys on either side-), or will the residents of the complex be the only ones to have direct beach access? So, it’s finally settled, then? I can only imagine what it will look like in situ. Definitely a mood altering structure. Dempsey’s was empty for way too long. Good bye to the vacant building. What a shame that the plans for the building make it look like a motel. “A fortress” “Set off from the rest of the community” Doesn’t scream trick or treat here. That kind of describes the current building there,no? It’s full of transients now. 15 Obetians who where a family were displaced. It’s a larger eyesore than ever. I hope you become displaced. Please move to north PB where you’ll appreciate those kinds of changes.